Search results for "michael maltzan"
The New Carver Apartments, an affordable housing complex designed by Michael Maltzan Architecture, has angled windows that shield the building from the freeway while making it dance before the oncoming cars. Downtown LA has been called the national epicenter of homelessness, with some preferring to sleep on the streets for years rather than risk their health and possessions in overcrowded temporary shelters. This problem was exacerbated in the 1990s by the widespread demolition of old SROs that failed to meet a tougher seismic code. Several local non-profits have built humane, low-cost housing for these urban refugees, but the designs have often been compromised by the exigencies of budget. The New Carver Apartments, located beside an elevated freeway on the southern edge of downtown, have set an exemplary standard for something better. stairs punctuate the dramatic courtyard, where structural members and ducts are sheathed in galvanized metal. 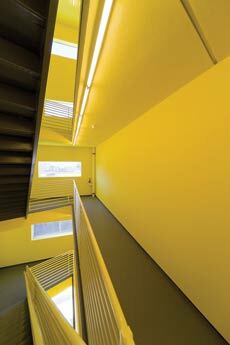 A coat of yellow paint helps make the stairwells bright. 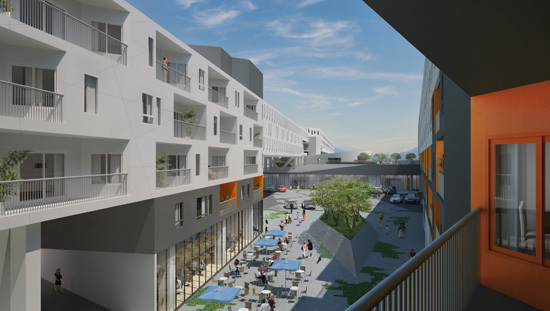 This is the second affordable housing complex that Michael Maltzan Architecture has created for the nonprofit Skid Row Housing Trust, and a third is in design development. The challenge for the architects was to make the best use of a confined lot and to infuse a block of small, single rooms with a strong identity. The trust decided to invest in high-quality construction to reduce the cost of maintenance. Like the firm’s Inner City Arts campus, which appears as a gleaming white apparition in a blighted neighborhood, so does this saw-tooth cylinder offer an oasis for its occupants, many of whom are ill or physically handicapped. “When people are on the street, they shut down,” said Maltzan. “Private space, counseling, and communal interplay can help them rejoin society. If you give tenants something they’re proud of, they’ll take care of it.” The absence of graffiti suggests that even vandals respect what he and project architect Kristina Loock have accomplished. The cellular structure of the block is transformed into a dynamic hub that seems to spin as you speed past at fourth-floor level. The cylindrical form minimizes exposure to the freeway, and the angles orient windows away from the traffic while catching the flash of headlights passing by. Close up, the building has a powerful presence. The wood-and-concrete frame is clad in white stucco with brilliant yellow accents. Axial corridors link the lobby to rooms for medical services and communal areas. Concrete steps rise up through the courtyard to connect residential levels to the ground floor. Ninety-five rooms are angled outward on five levels, and open onto galleries that encircle the inner courtyard, and onto two upper-level decks. Structural columns and service ducts on the inner surface of the cylinder are clad in galvanized metal, and these dramatically angled fins support the gallery’s handrails. They also serve as baffles to give residents—who may live here indefinitely and treat the apartments as their permanent home—a sense of privacy. Walls are heavily insulated and the small windows are triple-glazed to shut out the roar of freeway traffic. “We’ve come to realize the therapeutic value of good design,” said Mike Alvidrez, executive director of the trust. “There’s an optimism about our buildings. They indicate that there’s a solution to a seemingly intractable problem. On the street, the homeless wonder if anybody cares whether they live or die. Michael understands how to integrate architecture with our program and send a message to the larger community.” He saw how the contractor and subs shared his sense of pride, requesting copies of the rendering as a memento of what they built. The word “hope” in several languages is emblazoned across the lobby wall and it aptly expresses the project’s potential. The New Carver Apartments is a beacon in an otherwise rundown neighborhood, one that goes to great lengths to engage its surroundings. It is this mix of realism and idealism, functionality and inspiration that makes the New Carver Apartments (named for an older property that was torn down) such an important achievement. The building is far superior as a work of art to most so-called “luxury” apartments, with the power to transform lives and reshape public perceptions. Most architects would like to share their skills with a larger public but have found few opportunities to do so. Though the trust has to compete for funds and relies to a large extent on federal subsidies, they have hired such firms as Koning Eizenberg and Killifer Flamming to put up new buildings and rehabilitate old ones. They now own 22 downtown properties containing 1,500 units. In the New Carver Apartments, they’ve raised the bar and created a model of affordable housing. The winners will redesign the Arch site to better connect downtown St. Louis and the Mississippi River. An international cast of architects, landscape architects, engineers, and artists has been selected to advance in the competition to improve the urban and waterfront connectivity around Eero Saarinen’s iconic St. Louis Arch. Nine groups were chosen out of a field of 49 who submitted to the first stage. The field will further be narrowed in April to four or five who will produce designs, and a winner will be selected in late September. 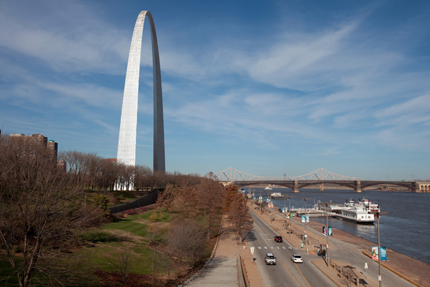 The Arch, formally known as the Jefferson National Expansion Memorial, and the Dan Kiley–designed landscape surrounding it are both National Historic Landmarks, and cannot be altered. 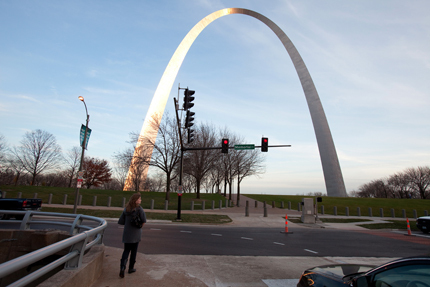 The Arch is difficult to reach on foot from downtown, a condition long lamented by city officials and a prime focus of the competition. The National Park Service and competition funders hope the redesigned site, which is a popular destination for visitors, can add more activity to downtown and the waterfront. The Arch is separated from downtown by numerous pedestrian obstacles. “The complexity of the teams reflects the complexity of the program,” said Tom Bradley, site superintendent for the National Park Service. “It’s a real urban design challenge.” The site is bordered by I-70, which has depressed lanes; busy Memorial Drive; and the hardscape waterfront, which is prone to heavy flooding. Organized by competition advisor Donald Stastny, the jury includes Boston Globe architecture critic Robert Campbell; Gerald Early, a professor of African and Afro-American Studies at Washington University; architects Alex Krieger and Carol Ross Barney; landscape architect Laurie Olin; Denis P. Gavlin, former director of the National Park Service; David C. Leland of the Leland Consulting Group; and Cara McCarty, curatorial director at the Cooper-Hewitt National Design Museum. A rendering of Michael Maltzan's Star Apartments, whose prefab elements should help keep construction time down. 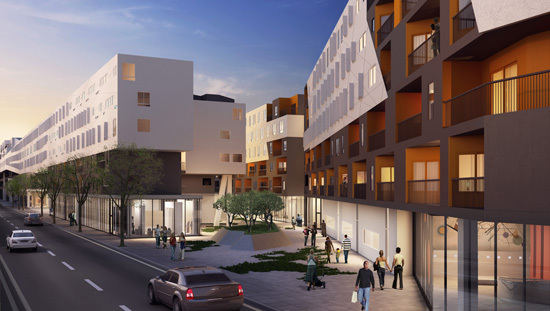 In the past few years, this paper has reported on the excellent architecture being produced in California’s low-income and homeless supportive housing sector, from Michael Maltzan’s New Carver Apartments to David Baker’s Folsom Dore Supportive Apartments. While creating these projects is always challenging given their limited resources, the challenge that architects complain about more than any other is the intense time crunch inherent in such work, and the pressure this puts on the quality of their work. Most low-income housing projects are funded through low-income tax credits, in which projects are given a strict time limit for construction—usually between 18 months and two years. This, say many, is too short to keep standards high, and puts undue pressure on a client to stick with a set team, even if that team isn’t up to par. 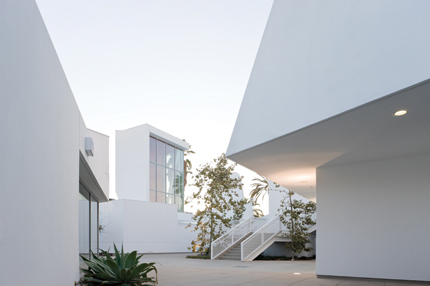 Daly Genik's recently completed Tahiti Housing Complex in Santa Monica. Tod Lipka, CEO of Step Up on Second, a supportive housing nonprofit in Santa Monica, adds that tight timelines not only hurt quality but also narrow options. He points to an instance in which his organization wanted a variance to remove underground parking from a project, since the homeless tenants didn’t have cars. After pursuing the variance for six months, the group had to abandon it because they needed to begin construction to keep their funding. Federal low-income tax credits are allocated by the state treasurer’s California Tax Credit Allocation Committee. The timelines, points out treasury spokesman Joe DeAnda, are determined on the federal level, and are meant to avoid cost escalations, to get people into needed housing quickly, and to avoid problems on the back end. “We don’t want to award credits to people who aren’t going to meet those deadlines,” DeAnda said. “There may be gripes, but this weeds out all but the most serious projects.” Projects are scored on the basis of readiness, affordability, number of units, and financing availability. They generally have 150 days to be construction-ready. They have two years from the award date to be built. “There are plenty who meet this deadline, so I wouldn’t say it’s a hindrance,” he said. However important these architects may be—clearly, like many other LA architects of their generation, they do impressive work—to suggest that New York has no comparable talent is absurd. Ouroussoff, long an admirer of Southern California architecture, turns even an article on the New York Five into an exercise in promoting LA’s “creative energy” and decrying New York’s dearth of “innovative architecture.” His claim that the most important contemporary works to rise in New York over the past decade were designed not by New Yorkers but by Angelenos (Thom Mayne, Frank Gehry), a Japanese woman (Kazuyo Sejima of SANAA), and a Frenchman (Nouvel) might actually be seen as a vote for the city’s confidence, strength, and openness—not something to be condemned. But more consequentially, using a discussion of the New York Five to argue that the city has closed itself off to innovative architecture is simply wrong-headed. For example, when the New York Five first appeared in 1967 at an Arthur Drexler–curated exhibition at MoMA, they had just emerged from East Coast universities and built only a few private houses. It was New York’s architecture media infrastructure (magazines, publishers, museums, galleries, and critics) that created the group, and it is frankly still without parallel in this country. In addition, the educational institutions in New York’s East Coast orbit, from whence came the Five, were and are still the most important in the world. These institutions educate and support architects with teaching positions at the highest level—including nearly every LA architect of any importance. Due in part to this unrivaled critical mass, the level of discourse, critique, and even experiment in New York can hardly be called staid. The type of architectural thinking that produced plans for the High Line and Fresh Kills landfill, to name only two recent New York projects, could only have come out of the East Coast architecture hopper. The Times article concludes that in New York, “Real change will first demand a radical shift in our cultural priorities. Politicians will have to embrace the cosmopolitanism that was once the city’s core identity.” Yet a recent trip to Los Angeles to look at the city’s new high schools, including Coop Himmelb(l)au’s new Central Los Angeles High School, makes it seem that it is the politicians in that city that have something to learn. A version of this article appeared in AN 09.30.2009_CA. But more consequentially, using a discussion of the New York Five to argue that the city has closed itself off to innovative architecture is simply wrongheaded. For example, when the New York Five first appeared in 1967 at an Arthur Drexler–curated exhibition at MoMA, they had just emerged from East Coast universities and built only a few private houses. It was New York’s architecture media infrastructure (magazines, publishers, museums, galleries, and critics) that created the group, and it is frankly still without parallel in this country. In addition, the educational institutions in New York’s East Coast orbit, from whence came the Five, were and are still the most important in the world. These institutions educate and support architects with teaching positions at the highest level—including nearly every LA architect of any importance. Due in part to this unrivaled critical mass, the level of discourse, critique, and even experiment in New York can hardly be called staid. The type of architectural thinking that produced plans for the High Line and Fresh Kills landfill, to name only two recent New York projects, could only have come out of the East Coast architecture hopper. A version of this article appeared in AN 09.09.2009. After several flush years, supportive housing for LA’s homeless faces an uncertain future. But that hasn’t stopped many architects from seeking such publicly funded projects to survive the economic downturn. At the height of the economic boom in 2005 and 2006, a number of projects for homeless housing, often involving top architecture firms, secured funding. 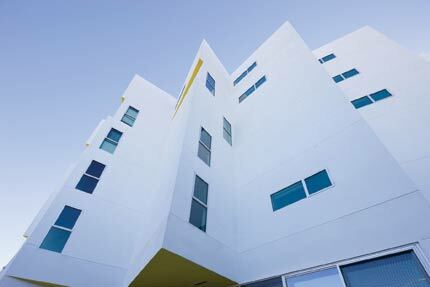 Michael Maltzan completed the Rainbow Apartments for Skid Row Housing Trust in downtown LA in 2006. He recently topped off another project, the New Carver Apartments, with 95 units of senior affordable and supportive housing arranged radially around a courtyard, and due to begin leasing in October. Killefer Flammang Architects Villas at Gower, a 70-unit permanent supportive housing project in Hollywood, should break ground in November. 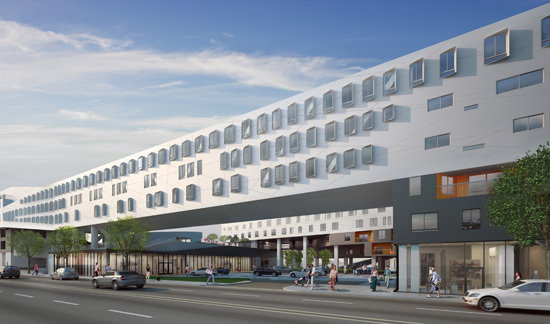 Koning Eizenberg is just completing the Abbey Apartments on Skid Row, while Pugh + Scarpa recently completed a 46-unit facility in Santa Monica called Step Up on Fifth. 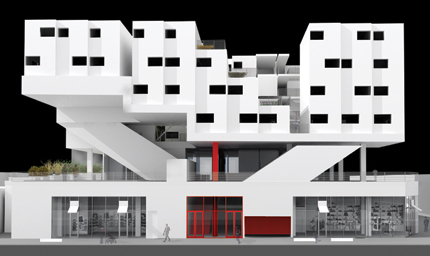 And Lorcan O’Herlihy Architects is collaborating with the Skid Row Housing Trust on an 82-unit site in downtown LA. Despite this flurry, future funding is in jeopardy. If passed, proposition 1E, on the May 19 ballot, would let the state legislature redirect funds from 2004’s Mental Health Services Act—which provided $400 million in funds for supportive housing—back into state coffers. Furthermore, money from 2002’s Housing and Emergency Shelter Trust Fund Act, or Proposition 46, has been disbursed more slowly than in the past, forcing non-profit developers to look for alternate funding sources. The failure of the state to approve a budget has also delayed bond issues for publicly funded projects. 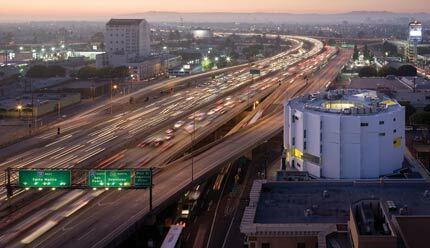 Just as seized-up credit markets hurt the larger economy, one frozen sector has consequences for every other, explained Molly Rysman, director of special projects at Skid Row Housing Trust. 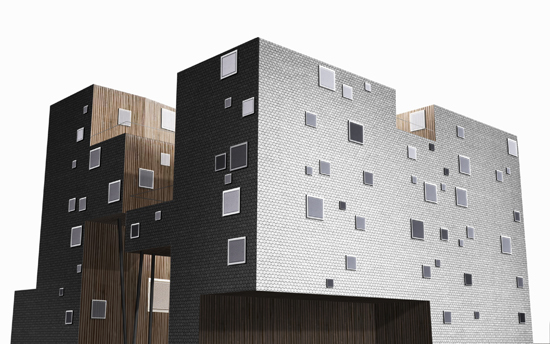 A supportive housing proposal by Lorcan O'Herlihy Architects. 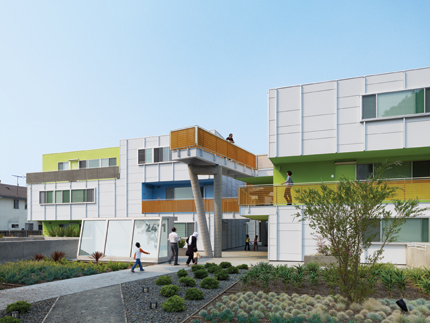 But despite the uncertain financial landscape, architects in Los Angeles continue to work closely with nonprofit developers on more affordable and supportive housing. In fact, with a relatively dire commercial market, more architects than ever are receptive to working with much tighter budgets in the public sector, said Lipka. One architect who has transitioned from commercial projects to publicly funded work is Lorcan O’Herlihy, who maintains that lessons learned in the private sector can translate into supportive housing design. “We take programmatic criteria—incorporate green roofs, cable systems for irrigation, landscapes into urban areas—and try to be inventive within strict parameters,” he said. 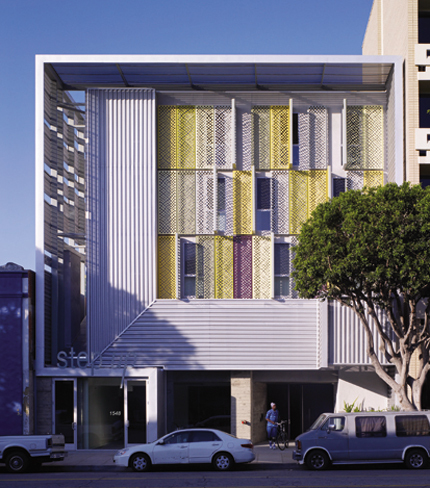 Pugh+Scarpa's Step Up On Fifth, a homeless shelter of a different breed in Santa Monica. 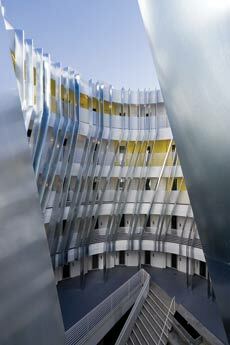 Michael Maltzan Architecture's Inner-City Arts. 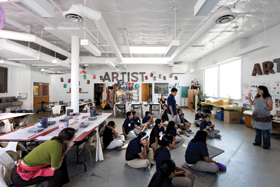 Inner-City Arts was founded in 1994 to supplement arts and cultural education for downtown Los Angeles students at schools where such programming had been cut. The final phase of its new campus opened on October 2 with a parade of pinwheel-waving kids led by Mayor Antonio Villaraigosa. Located on a one-acre site in the heart of Skid Row, one of the city’s most economically depressed neighborhoods, Inner-City Arts represents a 15-year collaboration between Michael Maltzan Architecture, landscape designers at Nancy Goslee Power and Associates, and environmental designers at Ph.D, who each donated their time over 15 years to the continuously-evolving project. The indigenous gardens within the courtyard include elements like a tiled fountain, a dry creek bed planted like a local arroyo, a teaching garden, and a labyrinth, all inspired by drawings the students made when asked to sketch their visions of the new school. 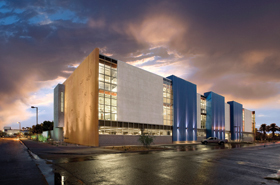 The completed design of Inner-City Arts creates a place for serious art making, said Maltzan, but is also an example of how an optimistic environment can impact a depressed area. “We’ve tried to make an entire campus which can be seen as a microcosm for a transformative experience,” he said. Under the design leadership of local firm Orcutt/Winslow Partnership, with input from science specialists and the local community, the Phoenix Union High School District recently opened their new comprehensive Bioscience High School in the heart of downtown Phoenix. Orcutt/Winslow’s design is strategically located within the Biomedical Research Campus, including the Translational Genomic Institute, where students participate in internships. The school’s pedagogical and physical organization models itself after these research laboratories, encouraging collaboration, team teaching, independent learning, and a “rigorous and relevant” science and math focused curriculum. It also integrates a historic one-room school house that now serves as the school’s administration center. Seven laboratories (six indoors and one on the roof deck) are the focal point of the campus, and around these are clustered the student “studios” (not unlike architecture studios), teacher work areas, and, at the extremities on two levels, naturally illuminated, flexible-dimension classrooms. 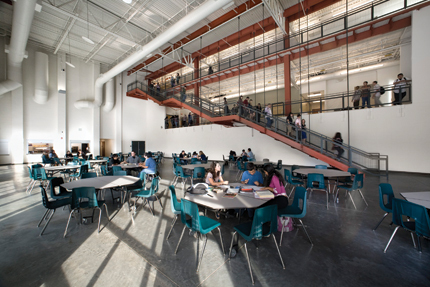 A multi-level space called Town Hall is the heart of the school—serving as the locus for presentations, the cafeteria, and a link to the desert courtyard. In support of scientific understanding, the open-web structure and mechanical systems are laid bare to the eye. Desert-specific environmental strategies include solar heated water, east and west facing tilt-up concrete “fossil” walls, and provisions for a photovoltaic array. Since it opened in 2006, Rosa Parks Elementary in Portland has been a community magnet. 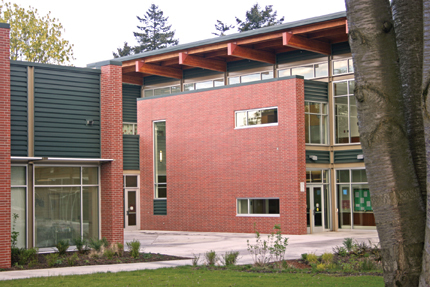 Part of the broader New Columbia neighborhood, a large and formerly run-down affordable housing enclave that has become the largest redevelopment project in Oregon history, the 66,863-square-foot, LEED Gold–rated K–6 school is also host to a Boys & Girls Club that opens when classes end and is available to other organizations in the evenings. The classroom wing is divided into what are called “neighborhoods,” two per floor, with five classrooms, a resource room, and a shared common area. The glass-enclosed west side of the building also opens out onto the trees with a small park-like green space and a bioswale. 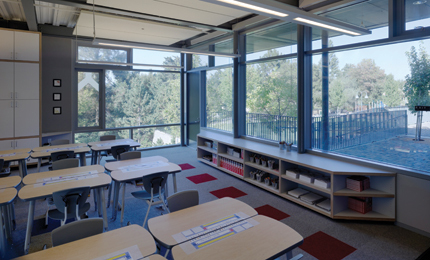 The configuration allows classrooms to receive natural light on both sides. 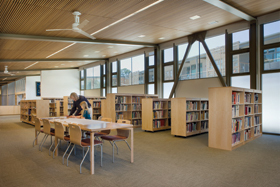 The school’s sustainable features include a stormwater management system that keeps all water on site, an array of photovoltaic solar panels, displacement ventilation, and extensive daylighting. Designed to be 25 percent more energy efficient than code and in actuality performing 30 to 35 percent better, Rosa Parks is the most efficient building in the Portland Public Schools system. “It’s not just to save energy, but to connect students to their world,” Ruiz said. 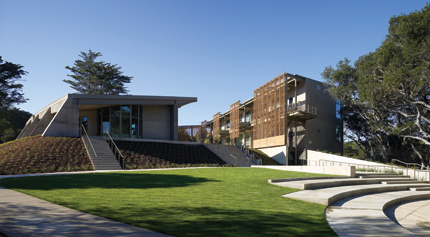 Mark Cavagnero Associates designed a 1,200-square-foot expansion for one of the K–5 school’s existing 1960s Bay style buildings, as well as a new 4,800-square-foot Enrichment Center containing classrooms for music, science, and the arts. 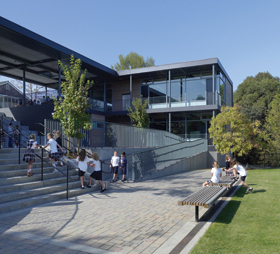 The project, pointed out Cavagnero, creates a much-needed connection between the school and its lush new yard and play areas, which are separated by a steep slope. A dramatic, canopied stair between the existing and new buildings has become the center of campus life. Large landings on either side of the stair as well as weaving terraces serve as perfect places to rest or eat lunch, and also function as places to sit for assemblies. The glazed, rectilinear addition to the existing building—which provides a much-needed extra classroom—edges into the hill and abuts the left side of the stair. Meanwhile the new building, clad in stained cedar with copious glazing, welcomes plenty of light and cross breezes thanks to its narrow floorplate and its orientation perpendicular to prevailing ocean breezes. Building this structure against the hill, said Cavagnero, was meant to make it feel as if it were “floating out from the hill and reaching out to trees.” None of the new construction uses air conditioning, and heating is by means of an underfloor system. With this 27,000-square-foot addition to an independent pre-K–8 school, Leddy Maytum Stacy has created a multifaceted environment that encourages learning and curiosity. Guided by the school’s mission to instill “a passion for lifelong learning” and a commitment to the environment, the design takes every opportunity to engage students with the world around them. The new complex expresses a strong connection to the 33-acre campus landscape and community. The three program elements—classrooms, library, and student center—occupy separate buildings, arranged around a plaza to form a hub of student life that stitches the 40-year-old campus together. The open, single-loaded buildings benefit from natural light, and living roofs totaling 10,000 square feet provide new habitats for native species, including an endangered butterfly. “X-ray” windows expose the building systems within, and a man-made “arroyo” activates the plaza during rainstorms. Finally, the LEED Gold complex teaches by example, using 65 percent less energy and 50 percent less water than a typical new school in the U.S., and generating 21 percent of its electricity needs through a 30kw photovoltaic array. Resource-efficient materials, 36 percent sourced locally, include non-native cypress trees removed from the site and milled for the building’s benches, screens, and decks. In that context, even virtuosos like Field Operations chief James Corner have submitted restrained or low-key playful approaches. “Do too much and you get the world’s biggest theme park,” he told AN, “so we really minimize the architecture.” The most fanciful proposal, from the team including Diller Scofidio + Renfro, works around the concept of “urban illusions,” including loaner bikes. Such fancy has prompted some observers to question whether the architectheavy roster is equipped to handle the site’s manychallenges. REX-NY principal Joshua Prince-Ramus, whose describes his firm’s proposal as a development scheme, endorses GIPEC’s logic of using public space to prompt private investment. “What they’re doing is really smart,” he told AN. “Private development won’t come without the grounds cleaned up in such a beautiful way that a university or institute would want to be there.” Indeed, GIPEC had tried earlier to start the revitalization process by asking developers’ teams to submit ideas for building out the island, then dismissed all those proposals, except for a small charter school, as insufficiently imaginative or financially feasible. The future, then, begins with open space that the public will use and love. A panel discussion on June 11 and public hearing on June 20, Koch promises, will clarify the public’s priorities for uses of the new park. The jury, which includes SHoP’s Gregg Pasquarelli and former Planning Commissioner Joseph Rose, will evaluate schemes over the summer.